Free Welcome Pack! Free Internet Wi-Fi! iPod Docking Station! Child safety gate for pool! All bedrooms have air conditioning. Airport Transfers and Car Hire Available! 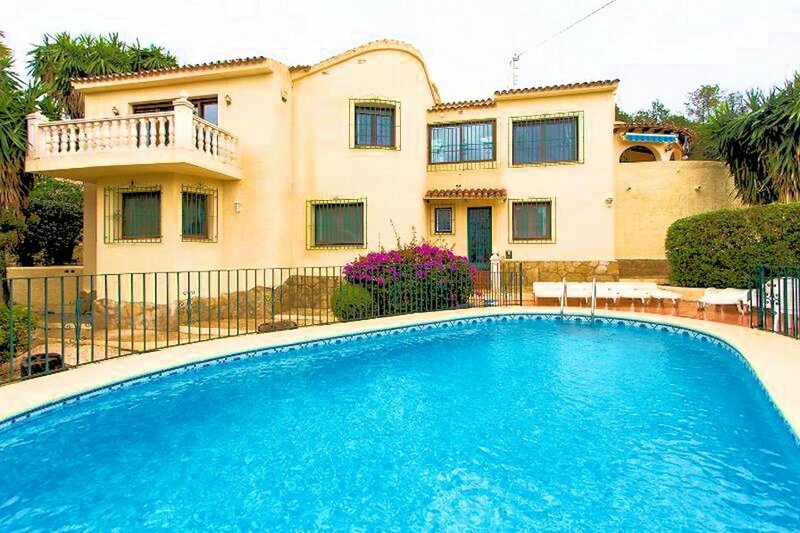 Villa Tallakim is a large 7 bedroom, 4 bathroom villa located just a short walk from the shops, restaurants and beaches of Moraira on the Spanish Costa Blanca. The villa has 15 bed spaces in 7 bedrooms and can sleep up to four additional children in Z beds and sofa beds. There is also a cot and high chair available. The villa has a gated entrance, private swimming pool with child security gate, and air-conditioning in all bedrooms. The front door leads into the hallway of the upper level of the villa and into the large lounge which is furnished with leather sofas and chair. The dining area provides space for 8 people to eat in comfort. There is satellite TV with UK channels, a DVD player and music system, an iPod docking station and free internet Wi-Fi. From the lounge you can step outside onto the large naya, which has a small sea view and is furnished with table and chairs making this area ideal for al-fresco dining. The hallway leads to a fully fitted kitchen with an oven and hob, dishwasher, large fridge freezer, washing machine and a microwave oven. There are 3 double bedrooms and a family room with a double bed, a single bed and a Z bed. One of the double bedrooms on this floor is the master bedroom which has a balcony overlooking the swimming pool and gardens. This room also has a luxury en suite bathroom with a corner bath/jacuzzi, spa shower, wc, and twin vanity units. You will also find a family shower room on this level. The upper level of the villa benefits from central heating (extra charge). At the end of the hallway there is a door which leads to the stairs going down to the lower level of the villa. This level has 3 bedrooms and two shower rooms. There are two double bedrooms, one of which has an en suite shower room; the third bedroom has two single beds. Here you will find another large lounge with leather sofas and comfortable chairs, TV, DVD player and music system. There is a double and a single sofa bed suitable for children in this lounge. The dining area has a table and six chairs and at the end of this room there is a well equipped kitchen with oven, fridge, microwave, dishwasher and washing machine. A door leads out to the pool terrace and gardens. Outdoors you will find large secure private grounds with off road parking and well-tended gardens with palm trees, citrus trees and flowering shrubs. There is a terrace with a shaded area overlooking the pool with sun-loungers, table and chairs and a barbecue. During some periods it may be possible to rent the ground floor only for up to 6 adults and 3 children or the first floor only for up to 9 people plus 1 child. In these cases the other floor would be locked and unoccupied.From October to March reduced price monthly rates are available. Families and mature adult groups only please.